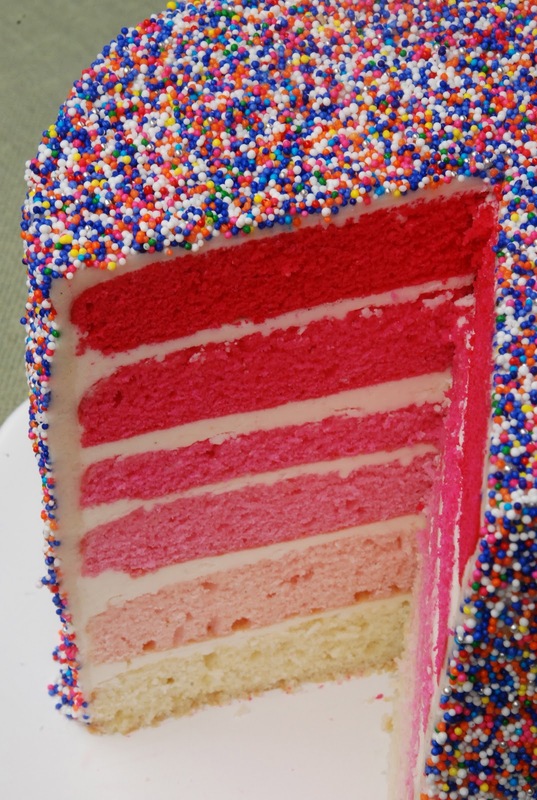 Let’s say it again: I LOVE this cake. This cake was inspired by this fabulous cake. My mother saw it online and asked for the same cake, but in pink! 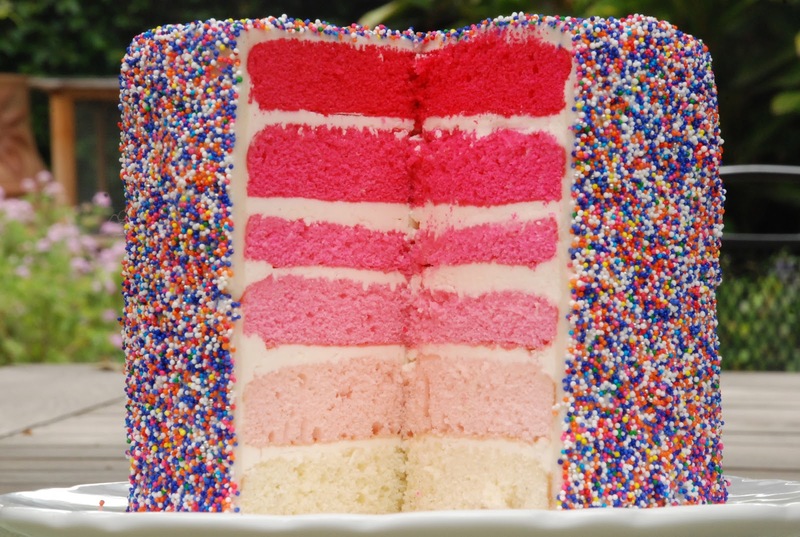 The outside of this tall cake is absolutely covered in rainbow sprinkles. I took all the nonpareils in the sprinkle drawer and mixed them together to make a huge bowl of rainbow sprinkles. And the inside is even more special! Six layers of pink ombre fade, each a bit more pink than the last. 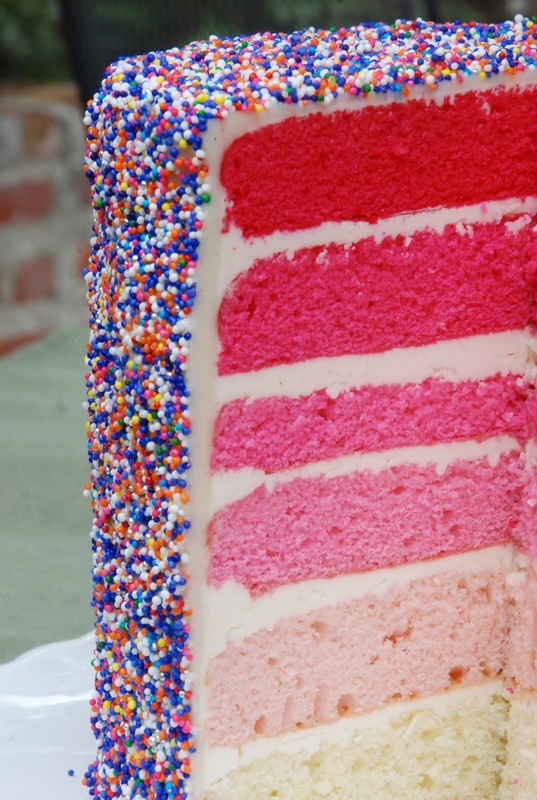 Pink cake and sprinkles, what more could you ask for? I served this cake with fresh juicy strawberries. I soaked the berries in juice and sugar, then dumped them on top of everyone’s slices. It was the perfect finish! Just be careful when adding the sprinkles…it’s a little hard to get them to stick to the sides and there were sprinkles bouncing all over my kitchen floor as I was throwing them at the cake trying to get them to stick. This cake was made for Mother’s Day, but it would be fabulous as a birthday cake or as a graduation cake if done in school colors. Or any type of celebration cake, really. It’s quite festive and I think I’m going to be using this decorating technique quite a bit. Maybe I should buy some more sprinkles. My Red Velvet Chocolate Chip Birthday Cake! So awesome, Maddie! I haven't really been into the “ombre” trend that I see on Pinterest and the like, but this made me change my mind! Thank you! 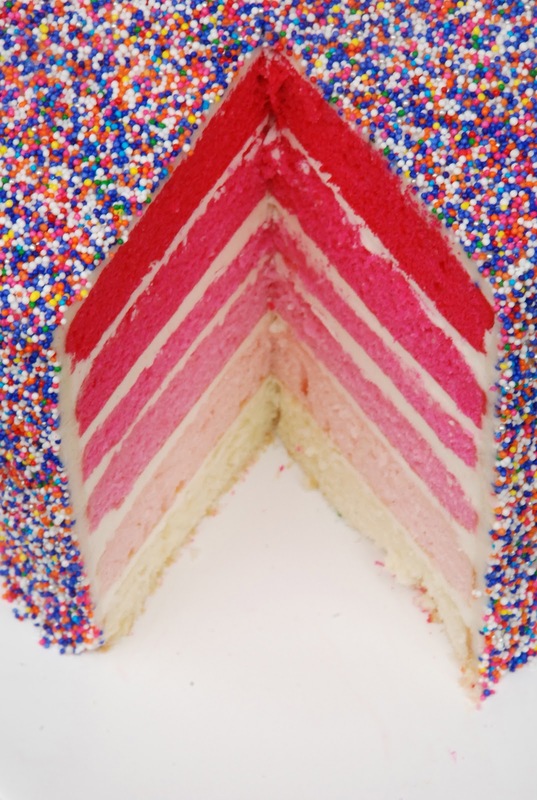 The best thing about this cake was cutting into it…so exciting! I mostly throw the sprinkles at the cake close range with the bake on a cookie tray to catch strays. 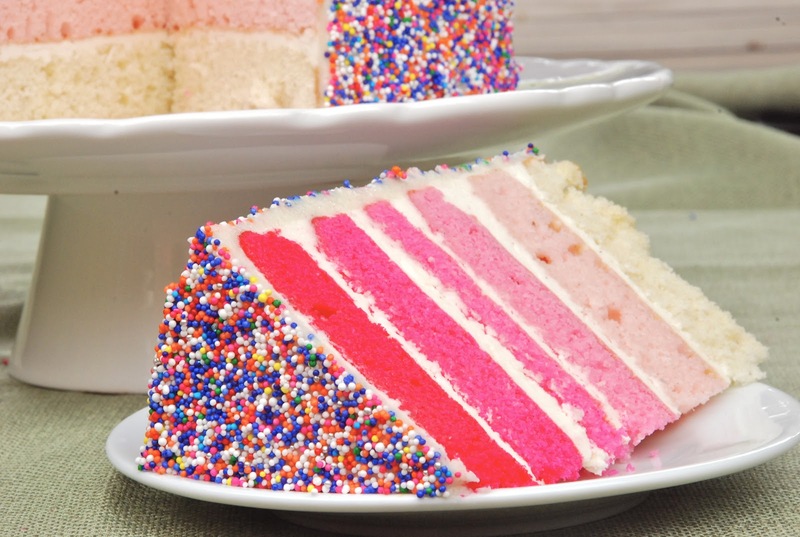 I also put sprinkles in my palm then carefully lean and flatten my open hand against the side of the cake. If there's an easy way to cover all the spots I have yet to figure it out, but the mess is part of the fun! 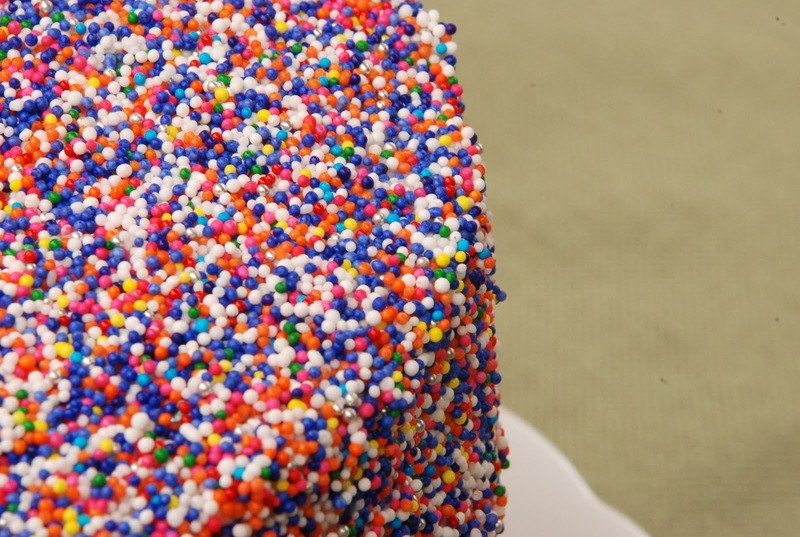 How many grams of sprinkles do you reckon you used? Would 450g be enough? 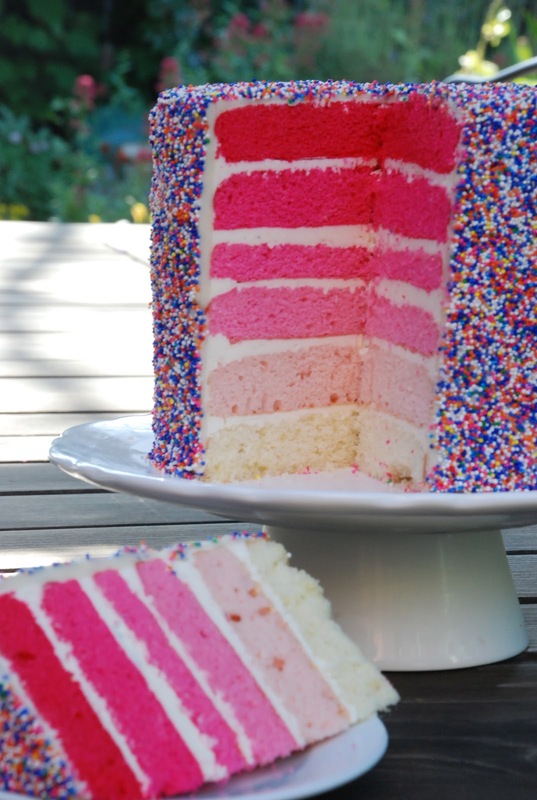 Want to make this exact cake it's so pretty! Thanks. 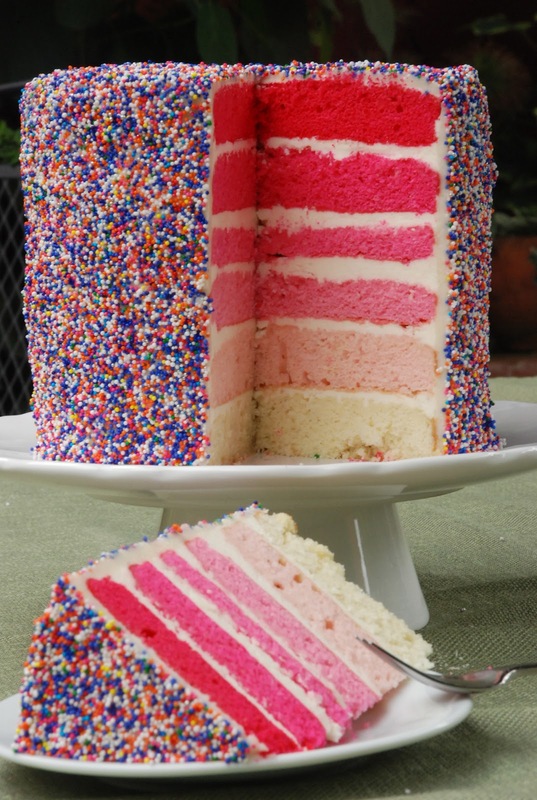 Hmm, it's hard to say because I made this cake so long ago and didn't measure sprinkles to begin with. Also, it varies quite a bit based on how big your pans are (If I recall correctly, this cake was 7 inches in diameter). Sounds like it should be enough though! If you're running low you can always sprinkles the sides only and leave the top plain.